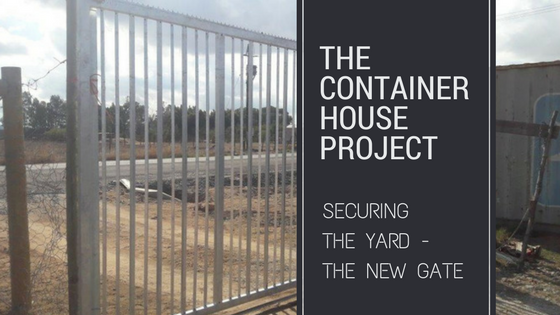 We want the security because building materials are in high demand and we are going to have lots of building materials and equipment on the property over the next few months. Galvanized to reduce rust as we do live in the Western Cape where things rust very quickly. Kevin put some thought into our new gate and before long he was busy in his Epping workshop container (yes, we have a thing for shipping containers at the moment), cutting and welding furiously in order to make up our smart, new gate. Meanwhile, back at the ranch (um, our plot), Louis was installing the gate track for the gate to sit on. The custom made track is embedded in 25mpa concrete to ensure we have no problems with heavy trucks driving over it. Did We Meet the Criteria for Our Gate? The gate is very big, measuring 4.2m wide and 2.2m tall. Kevin got about half way through making the gate by himself before needing help to move it as it quickly got quite heavy. Kevin had the ingenious idea of installing a lock on the gate so we don’t need to fuss with chains and padlocks before the motor is installed. A key locks and unlocks it and Kevin only made a keyhole on the inside, making it extra secure as no-one walking by will know that there is a lock fitted to the gate. He also fitted an anti-lifting mechanism with the lock. One of the reasons why the gate is so heavy is because it has many bars to keep the various animals on the correct side of the gate. Not even a chihuahua will get through! So, how heavy is the gate? After galvanizing the gate now weighs 122kgs. Install the gate, tidy up the fence and voila! In making the gate, Kevin used 40mm rectangular tubing, 38mm square tubing, 25mm square tubing and 19.8 square tubing, as well as the lock block, lock, wheel set and assorted flat-bar and angle iron (for the anti-lift and gate guides). They supply all manner of steel stock, fencing, hinges, bolts, etc, as well as some ready-made items such as wash-line posts. My favourite part of the shop are the baskets and baskets of steel flourishes and ornamental castings used to decorate metalwork. Click here for Steel & Pipe’s contact details. If you want to make your own gate, quite a long list of tools is required, such as a welder, grinder, tape, square, sanding disks, drill, circlip pliers (for removal and refitting of the gate wheels), hammer and corner welding magnets (to keep it square when welding). Hot dip galvanizing is a crude process and adds quite a lot of weight to the gate. There are prettier finishes, but it is one of the best anti-rust treatments. When making something that will be galvanized, remember to drill drainage holes at least 8mm in diameter on the lowest corner of every piece so that the galvanizing can drain out. Ventilation holes (can be smaller – Kevin made 6mm holes) are needed in the top to help facilitate drainage. Remember that any excess galvanizing caught inside your piece will cost you. You will be charged per kilogram on the finished product after galvanizing. Fun Fact: The drainage and ventilation holes are also necessary because of the temperature of the galvanizing. The temperature difference between the item itself and the galvanizing can cause tubing to explode if it has not got sufficient vents. Well done, Kevin and Louis! Excellent work! Thank you! We are very happy with the end result.